A new species of small carnivore, known as Durrell’s vontsira (Salanoia durrelli) has been identified by researchers from the Durrell Wildlife Conservation Trust, the Natural History Museum, London, Nature Heritage, Jersey, and Conservation International (CI). 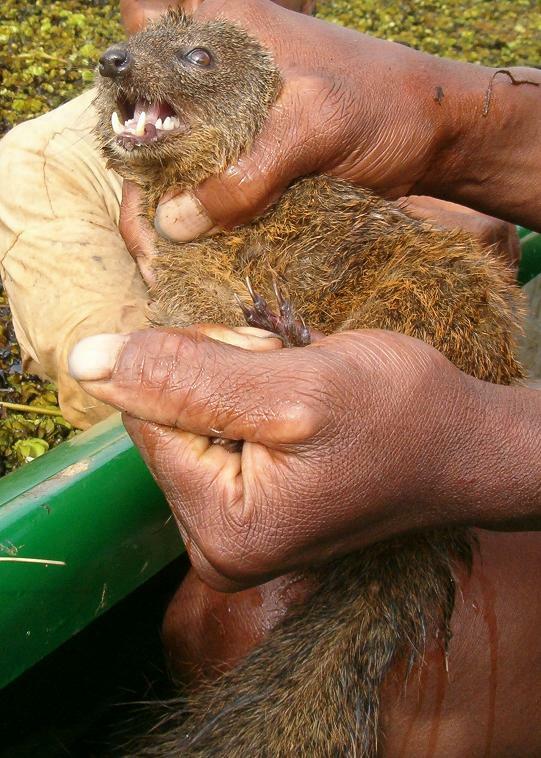 The small, cat-sized, speckled brown carnivore from the marshes of the Lac Alaotra wetlands in central eastern Madagascar weighs just over half a kilogramme and belongs to a family of carnivores only known from Madagascar. It is likely to be one of the most threatened carnivores in the world. The findings are outlined in the latest issue of the taxonomic journal Systematics and Biodiversity. The carnivore was first seen swimming in a lake by researchers from the Durrell Wildlife Conservation Trust on a field trip surveying bamboo lemurs (Hapalemur griseus alaotrensis) in 2004. After briefly examining the animal, the team suspected they had witnessed a new species and so took photographs. By examining brown-tailed vontsira (Salanoia concolor) specimens in the Natural History Museum’s collections, Museum zoologists confirmed the animal was a new species. The brown-tailed vontsira is the closest relative of the new species, which zoologists named in honour of the conservationist and writer Gerald Durrell, who died 15 years ago. The habitat of Durrell’s vontsira has been suffering from a number of threats over the past decades, from introduced fish to silting and pollution from fertiliser and pesticides. While the conservation status of the new species remains to be formally evaluated, it is likely to be threatened as a result of small population size, restricted distribution and the impact of habitat degradation. Remarkably, Lac Alaotra hit the headlines only a few months ago when the extinction of the Alaotra grebe (Tachybaptus rufolavatus) was announced. Now a new species has been described from the very area where the last Alaotra grebe was seen.